Gold and silver futures marked a near two-week high Wednesday, boosted by safe-haven demand as global stock markets tumbled. Gold for February delivery tacked on $17.10, or 1.6%, to end at $1,106.20 an ounce on the Comex division of the New York Mercantile Exchange. The settlement was the highest since Jan. 7. Gold prices ranged from a low of $1,087.10 to a high of $1,109.90. On Tuesday, they dipped $1.60 or 0.1%. "We have a lot of fear today that’s gathering steam," Bloomberg News quoted James Cordier, the founder of Optionsellers.com in Tampa, Florida. "We definitely have some diversifying going on out of stocks and into fear trades, which is gold today. With the combination of a lack of inflation in the U.S. and the turmoil in the stock markets, there’s no other way to look at the Fed right now other than they’re on hold." U.S. consumer prices declined 0.1% in December with the rate of inflation rising 0.7% in 2015, the second slowest pace for a calendar year in over 50 years, according to a U.S. Labor Department report released Wednesday. Up for a third straight session, silver for March delivery added 3.9 cents, or 0.3%, to close at $14.16 an ounce. Like gold, silver’s settlement was the highest since Jan. 7. Silver prices traded between $14 and $14.22. They are 1.9% higher on the week. April platinum declined $11.10, or 1.3%, to $819.20 an ounce, ranging from $814.60 to $829.80. Palladium for March delivery shed $7.90, or 1.6%, to $489 an ounce, trading between $483.35 and $496.25. Gold added $15.50, or 1.4%, to $1,101.75 an ounce. Silver added 2 cents, or 0.1%, to $14.05 an ounce. 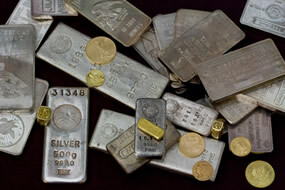 United States Mint bullion sales were unchanged Wednesday following sharp gains on Tuesday. Below is a sales breakdown of U.S. Mint bullion products with columns listing the number of bullion coins sold during varying periods. Products with an asterisk (*) have sold out. What is the story with platinum? It use to sell higher than gold.